Our primary objective at The Polaris Pointe is to ensure that you have an excellent travel experience while visiting our home on Snowshoe Mountain. Whether you’re coming up to ski 🎿 or snowboard 🏂 in the winter or creating a family vacation or a rafting trip or golf outing this summer or if you’re visiting to check out our amazing autumn foliage... Our objective is to make certain that you have a great travel experience while you are visiting Snowshoe. We will strive to ensure that happens! The Polaris Pointe at Snowshoe is your luxury alternative this summer and fall at Snowshoe Resort located on North Westridge Road. Come check out all that Snowshoe Mountain Resort has to offer at The Polaris Pointe. 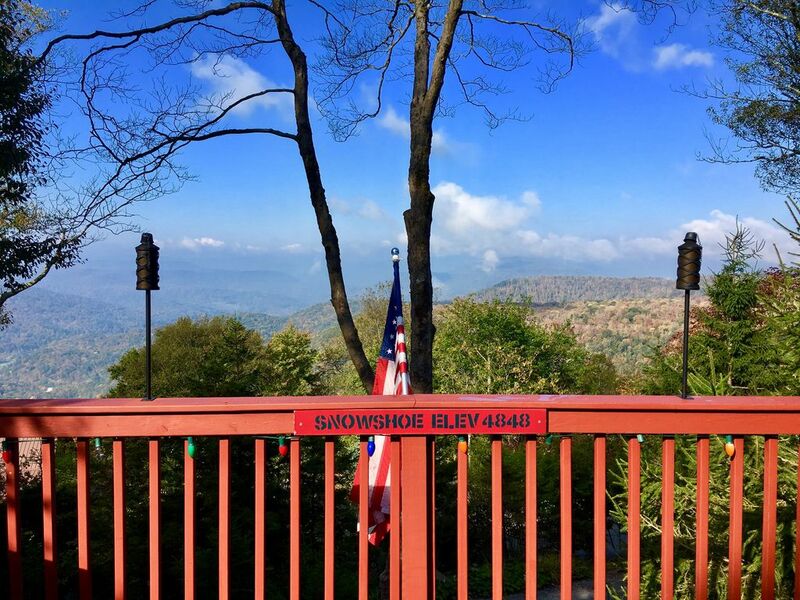 Our view offers one of the most spectacular panoramas from Snowshoe mountain. Enjoy 3925 ft.² of luxury and amenities including our J-XL hot tub. We have repainted our entire home and added new artwork from local artisans from the areas of Marlinton, Lewisburg, the New River Gorge and Hillsboro. Come check out our view and stay for the enjoyment and luxury of The Polaris Pointe. The Polaris Pointe comes equipped with a gourmet kitchen which has all of the amenities including a Whitehaus gourmet sink, a Moen Brantford MotionSense Kitchen Faucet with Reflex, a mini-bar, trash compactor, beautiful granite counter tops, a 4-burner gas cooktop and a double-electric baking range. If you’re considering visiting this summer, The Polaris Pointe is ideally located close to Shavers Lake and to Snowshoe Village As well! You can pick up our Westridge shuttle to either location at the bottom of our driveway or drive a short distance if you would prefer to do that instead. We have an LG door-in-door refrigerator which will be stocked with beer and soft drinks upon your arrival. This is The Polaris Pointe Version of Ohio Hospitality for our guests! Our kitchen also fully equipped with a waffle maker, two blenders, plenty of wine glasses, a double range, a gas cooktop stove, and microwave oven, a crock pot, and all of the amenities you can possibly imagine in a well equipped and well crafted kitchen. Our home has a beautiful great room with a real fireplace adjacent to the kitchen and there is an alcove to store the firewood. There’s also plenty of extra firewood in the storage bin in our backyard. The great room has amazing views of Snowshoe's Western Territory and its' sunsets as well. On a clear day, you can see Cupp Run and Shay's Revenge from our spacious deck 500+ square foot deck. We have a Jacuzzi J-LX hot tub. The Jacuzzi® J-LX® combines comfort and modern style for six to seven adults. It has Top-of-the-line PowerPro® Jets, including four bold RX Jets which combine performance with comfortable seating without compromising hydromassage power. The modern, streamlined design combines LED lighting on the perimeter, underwater and in the back and neck waterfall and it exceeds all West Virginia and California Energy Efficiency standards. For your safety, always remember to shower before and after the use of the hot tub. We use bromine and some folks are allergic to that product not knowing so. Bedroom one, on the first floor,has a queen bed and closet and a full shower/bath as well as DirectTV. Our Dining Room seats 8 and has a gas fireplace. The Dining Room has pictures around the room of the New River Gorge which is a beautiful 2 Hour Drive to some of the best white water rafting in The United States. There is a separate den and entertainment room for watching HDTV and playing video games. The entertainment center in the Den features a Bose stereo system and a Samsung Curved 4K HDTV. We have a Sony PlayStation in the Den for the kids to enjoy video games. There's also a futon in the den which can sleep two teens or one adult. In addition, there is a checkers and chess table in the den too. Upstairs, there are three bedrooms. The master bedroom is very spacious at about 300 square feet. We have DirecTV and a curved 65 inch Samsung HDTV in the master bedroom for your enjoyment. There is a large master bathroom which includes a large shower, commode, twin sinks and a Jacuzzi tub. Down the hall, there are two additional bedrooms. The third bedroom has a single bed and a twin futon. The fourth bedroom has a new queen bed and twin bunk beds which can sleep four in that room. Adjacent to the fourth bedroom is a bathroom which has a shower, commode and a sink. We have installed a new queen leather sleeper sofa in the great room which will accommodate two more bringing our max occupancy to 14/15 guests. We have a brand-new washer and dryer located upstairs for your convenience in bedroom three. We also have a Char-Broil gas grill, with a side-burner, outside if you would like to do some outdoor grilling. Outside, there is a large deck that is about 500+ square feet with beautiful views of Snowshoe's Western Territory and the sunset (weather permitting of course). This home comes with luxury throughout including high speed internet and wifi, 4 HDTV's including one Samsung Curved 4K TV in the Entertainment Center/Den. We have just installed fiber internet and phone with Citynet of West Virginia so we now have outstanding wifi service and phone as well. Our home comes equipped with DirecTV which includes the movie packages of HBO, Starz, TMC as well as Showtime. The home has a small single-car garage and and an extra freezer in the garage. If you would like to have food catered into our home during your visit, we have a relationship with Bill Treadway who owns South Mountain Grille. At the clients' expense, we can assist you in having a private chef during your visit for part or all of your stay with Bill. We are just a half-mile from the slopes but If you want to travel from our home to anywhere on the mountain, the Westridge (complimentary) shuttle will take you anywhere you want to go on the mountain. We are 1.0 mile from the top the mountain and all of the amenities in Snowshoe Village and only half a mile from Silver creek and Shavers Lake. Visit The Polaris Pointe at Snowshoe and experience the very best luxury home Snowshoe has to offer. Snowshoe, W.Va., is the crown jewel of powder skiing in the Mid-Atlantic. “They receive the most natural snow at 180 inches per season; they have the largest vertical drop of 1,500 feet; and they offer the most skiable terrain at 244 acres,” says skisoutheast.com. Snowfall increases with altitude and Snowshoe’s summit is the tallest of the five, topping out at 4,848 feet. And the further you go up, the colder it gets; ensuring what falls as liquid at lower resorts falls as snow almost a mile up. The Snowshoe Westridge complementary shuttle is available to you with complimentary service and it will take you anywhere on the mountain that you want to go as well. The Westridge shuttle is free and runs all day into the night until 12:00 a.m.
* During the winter months - we require 4-wheel-drive vehicles or all wheel drive vehicles with chains on the mountain. It is difficult to get around the mountain and up and down our driveway without four-wheel-drive or chains. We plow the driveway during the week, but it is imperative to have 4-wheel drive to be safe. Cars will not be able to make it up and down our driveway or on the mountain when it snows... Thank you. My name is Bob Deitrick. Steven Morgan and I own Polaris Financial Partners - a wealth management and financial planning practice that specializes in working with professionals, salaried executives, owner of closely-held businesses and affluent retirees. Our practice is client focused and we are driven toward creating results and a great experience for our clients as well. We purchased this home because it is one of the most beautiful homes on Snowshoe Mountain, and I have been coming up here for thirty years since my college years at William and Mary. We want The Polaris Pointe at Snowshoe to be one of the premiere home values to rent on Snowshoe Mountain. The uniqueness of this home is its inherent ski chalet charm and its views looking to the west and down to the Western Territory which are breathtaking (when the weather permits of course). Also, the home has a beautiful fully-equipped kitchen and great room. We have installed four HDTV's and you have DirecTV to see all of your favorite movies during your stay. Also, we have a separate dining room and an entertainment room for the kids to hang out at. Our new Jacuzzi J-LX hot tub, which is on the main deck, is superior as well. toilet, tub, shower, jetted tub, Master bath has a lg shower, a double sink, and jacuzzi tub. Downstairs bathroom has a full shower bath. Master bathroom upstairs has a Jacuzzi bathtub and a full shower. Third bathroom upstairs has a shower and commode. We have a beautiful view of the Western Territory of Snowshoe Mountain. On a clear day, you can see 30+ miles almost to Marlinton looking to the west and south. There is a phone with unlimited long distance in the house. The house has air-conditioning throughout the house in the summer although it is not often that it is needed with our cool summer nights on the mountain. Our home has propane furnace heat and some baseboard heaters as well. Linens and blankets are provided for the renter. All the beds will be made before you arrive. We have two sets of washers. There are two fireplaces. A real fireplace in the great room and a gas fireplace in the dining room. We have a single car garage and parking for a total of four cars. There is a small single car garage. We have high-speed Citynet Wi-Fi throughout the entire house. All the beds will be made before you arrive. We have high-speed Wifi thru Citynet at our home. Our living room consists of 2 couches that will seat up to eight people, a great fireplace and a 65 inch 4K HD TV, a huge ceiling fan and vaulted ceilings also we have DIRECTV and HBO, Showtime et al. Our automatic dishwasher is located to the right of the sink. We also have an LG door-in-door refrigerator which will be stocked with beer and soft drinks before you arrive. This is The Polaris Pointe Version of West Virginia/Ohio Hospitality for our guests! We have a double oven for baking and broiling. We have a double oven range. Our microwave is located underneath the stairwell closet. We are both a Keurig coffee maker and a traditional coffee maker as well. We have a four slice toaster. Our kitchen also includes A waffle maker, two blenders, plenty of wine glasses, a double range, a gas cooktop stove, a microwave oven, crock pot, and all of the amenities you can possibly imagine. We have ample dishes, plates, bowls and utensils for up to 14+ guests. We have a contemporary kitchen with all of the amenities one can imagine for cooking and baking. We have a turkey roaster, two blenders, mixing bowls, baking dishes and pans, a microwave, et al. Our dining room has a table that seats eight. The pictures in the room are from the New River Gorge in West Virginia. It also has a gas fireplace and a high chair if needed. There are four 4K HDTVs in our home. The TVs in the den and great room are 65 inch 4K TVs. Our home has DirecTV which includes all the movie channels. They include HBO, Showtime, stars, and the movie channel. We also have Netflix if you want to stream directly on the TVs from there. We have a Bose stereo in the den which can be heard throughout the lower floor of the home. We have a Nintendo PlayStation with all of the games you can imagine. We have Sony PlayStation with all of the games as well. We have a very large balcony that is 500 square feet which is great for entertaining or watching the sunset. Our deck has plenty of seating capacity as well for up to 12+. We have a wrap around deck/porch around the entire home. We have a large deck that has great views of the Western territory at sunset. The deck actually wraps around the entire house. We are within 1/2 of a mile to a mile of Silver Creek and Snowshoe Mountain. You can take the complimentary shuttle from the base of our driveway to anywhere you want to ski or visit at Snowshoe. There are several stairs to get to the front door, but it is not totally inaccessible. We are working on making the front access more accessible in 2019.
we have a 6 person Jacuzzi hot tub that is new. This is the second time that we've stayed at Polaris Pointe this year and loved it even more than the first. We had a much smaller group for skiing and didn't require all the space that this beautiful house has to offer. However, upon chatting with the owners they offered us a deal we couldn't refuse, but only after helping us to research other properties in the area and determining that few lived up to the amenities of Polaris Pointe. The reasons we visited again within a two-month time period. 1. The owners Bob and Steven offer first class customer service. They are in constant communication and will accommodate even the smallest of needs. I’ve never experienced the service they provide at a rental property. 2. The house is fully stocked with anything you could possibly need including the little things such as spices, cleaning supplies, shampoo/conditioner/lotion and nearly every kitchen utensil known to man. Additionally, Bob and Steven will stock the fridge with soda, beer and wine of your choice as a welcome gift. My son thoroughly enjoyed the Mt. Dew and Dr. Pepper that he never gets at home. 3. The house is huge and comfortable and offers a lot of privacy inside and out. Also, the hot tub is super inviting after a long cold day on the slopes. 4. The shuttle service into and around Snowshoe Village is AMAZING! Once we arrive at the house we don't get back into our car until it's time to go home. We chose Snowshoe as our spring break destination because we thought that it would be less crowded even if the snow wasn't the best. Turns out it was less crowded (averaged 6 runs an hour with no wait for the lift) and the snow was still awesome. It's best to make sure you're skiing early as later in the afternoon it was getting a bit slushy, but you can't beat 5 hours of skiing with no lift lines. It was a fantastic trip that we hope to repeat next year and of course stay at Polaris Pointe. It was an absolute delight to have you and your family return to The Polaris Pointe in March. Thank you for staying with us, thank you for your business and thank you for the wonderful review as well. It has been a pleasure and a delight to work with you and we look forward to having you return sometime soon. We always offer our returning clients a nice discount and we hope you’ll consider taking advantage of that. We also intend to make some nice improvements to the home this summer and fall when we have some free time. It’s thanks to clients like you that have made our home a success. Have a wonderful spring and summer as we look forward to talking to you and seeing you again soon! Great trip, really nice home. We had a great trip and the hosts were more than accommodating. They offered suggestions for everything, even offering to deliver us some groceries! The house was very clean, spacious, and well taken care of. The hot tub was great as well, and a bonus for us was there was that the outdoor decks were gated so that our dogs could hang out outside with us without us having to tie them up or worry about them running off. Great property for a family vacation. We'll be coming back next year hopefully! Erin: It was an absolute pleasure to have you and your family as our guests this year! Thank you for staying with us and we look forward to having you back sometime in the next year. You were an absolute delight to work with by the way. We’re glad to hear that you appreciated our personal touch and our service. We always provide a nice discount to our returning clients... Again thank you again for booking with us, Erin, and we look forward to seeing you back soon. Have a wonderful week! We had a wonderful trip to Snowshoe and Polaris Pointe was the perfect house for our party of 4 adults and 5 kids. We cooked dinner at the house every night, and the kitchen was stocked with every appliance and utensil we needed. Beer, wine, and a variety of snacks were awaiting us upon our arrival. There were plenty of bath towels and even shampoo and conditioner available for us. We were lucky enough to have snow while we were there and the driveway was plowed promptly. Bob and Steven were in touch before, during, and after our stay with helpful advice and seemed to truly want us to have an enjoyable stay. We were sad to leave but hope to be back next year! Julie: Thank you so much for the wonderful and very kind review. Your thoughtfulness is genuinely appreciated! It was an absolute delight to work with you leading up to your trip, and Steven and I are so glad to hear that your family had a good time while you were at our home at Snowshoe. We look forward to having you folks back again sometime very soon! I want to thank you for what you apparently did which was above and beyond the call of duty by washing the towels for Jason so that chore would be done before he arrived. Again very kind of you. Have a terrific week and thank you for staying with us and we look forward to having you return sometime next year. And when you decide to return - we will provide a nice discount plus a complementary 4th day, if you would like, as well. Gorgeous luxury home perfect for family ski trip! Our stay at the Polaris Pointe was absolutely perfect! The excellent and helpful communication from Bob and Steve to their willingness to accommodate our group's particular needs made this an easy, stress-free stay. The house is absolutely stunning with amazing views, easy access to the slopes by a short and reliable shuttle ride, and every amenity you could wish for! The snacks and beer/sodas stocked for us in the fridge on arrival were a really nice touch, and the house was very clean. We particularly enjoyed the beautiful kitchen which had all the bells and whistles and really high end finishes. We all enjoyed the hot tub on the deck; the fireplace in the family room was a real gathering point - we hung out there playing card games and watching the falling snow. Thank you for such an wonderful family weekend and all the great memories we made while there! We truly didn't want to leave and will return again in the near future. Heather: Thank you so very much for staying with us. It was an absolute delight to work with you and your family and Steven and I are very glad to hear that you had a wonderful time. That was our primary goal. We wish you all the best and look forward to your return at some point in the future. We always provide a very nice discount for our returning guests! And as we did for you folks - we always try to give our guests a late checkout (if we can as well) which in this case provided you guys an extra day to ski. Again it was wonderful to work with you and we thank you for visiting us at the Polaris Pointe at Snowshoe. SPECTACULAR HOME AWAY FROM HOME!!! Thank you so much Bob and Steve. Thank you for the amazing review that you posted today on our home. Indeed, it was a pleasure to have met you, Carol, and to have had you and your family as our guests at The Polaris Pointe at Snowshoe! We were so glad to hear that you enjoyed your first time at Snowshoe Mountain Resort and Steven and I look forward to having you return to our home sometime next year as well! Hospitality management is something we truly take great pride in with our business at Snowshoe and with Polaris Financial Partners and we are glad it has paid off here and that you departed feeling very pleased! Btw, we always provide a nice discount, Carol, to our returning clients. Again, thank you for staying with us at TPPS and please feel free to reach out to us at anytime when you are making your plans for 2020! Have a nice weekend! The house was very clean and stocked with snacks and drinks when we arrived. Bob was extremely helpful and responsive any time we had questions. The shuttle was a great perk of this house- just call and request a pick up and they are there within 5 minutes to take you anywhere on the mountain! Will definitely be returning next year and would highly recommend to anyone who appreciates great service. Josh: Thank you very much for the review and the terrific feedback as well. It was a pleasure to work with you and Steven and I are glad you guys had a great experience at our home. We are doing some pretty major things to improve the home in the Spring and we look forward to having you return next year! Thank you again and have a great week! The renter pays for a combined cleaning and hot tub fee during your stay in the amount of $220.00 (plus tax). We include linens in the fee and we will have all of the beds made upon your arrival. We request that you please strive to leave the home as close as you can as to how you found it for our housekeeper who does an excellent job of maintaining the home... We also ask that you take any bagged trash to the West Ridge dumpster at the end of West Ridge Drive at the end of your stay. Thank you very much. If you have any questions, please contact Bob Deitrick . Or you may contact our concierge professional Jason Cassell.